If you received a Juror Qualification Questionnaire from the U.S. District Court, you are being considered for jury service. This is not a summons for jury service, therefore, DO NOT report at this time. Please complete the Questionnaire online using eJuror within 10 days of receipt. *NOTE* If you have general remarks, comments, or excusal requests, please send them by email (see the email link above) and someone in the Jury Department will respond as soon as possible during normal court business hours. CLICK ON THIS LINK FOR A LIST OF FREQUENTLY ASKED QUESTIONS. Welcome to federal jury service! 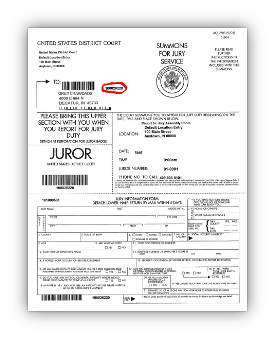 Please return the Juror Information Form located on the lower-half of your summons within 5 days. You may do this electronically using eJuror or send by U.S.mail. Have a question about this form? You can Email the Jury Department, Call the Jury Department at 1-800-524-9609 and press 1, or Check our Frequently Asked Questions. Check eJuror to find out if you need to report for jury duty. You'll need your 9 digit Juror Participant Number located on the front of your Summons. Once you log in, click on the Current Status link on the left side of the web page. Or, you can call our toll free line at 1-800-524-9609 and press 1. Want more information about Federal Petit Jury Service in our district? Click Here for detailed information. Check Reporting Information By Phone: Call 1-800-524-9609 and Press 1 if you are calling about receiving a Summons. Please reference your participant number when leaving the message. 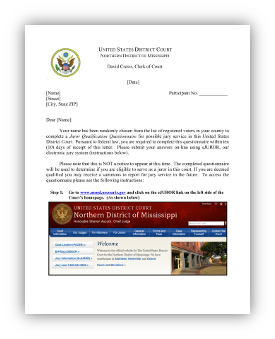 Did you receive a form for GRAND JURY SERVICE? Learn more about being a juror and the federal courts.